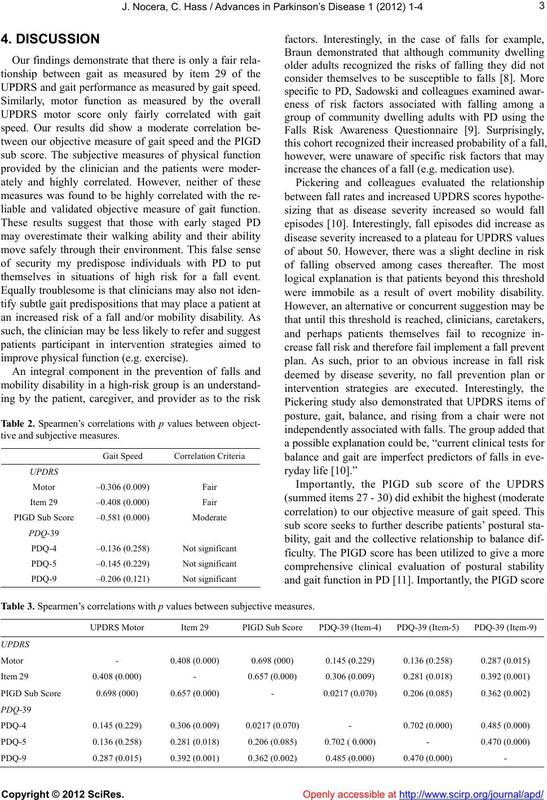 Should gait speed be included in the clinical evaluation of Parkinson’s disease? 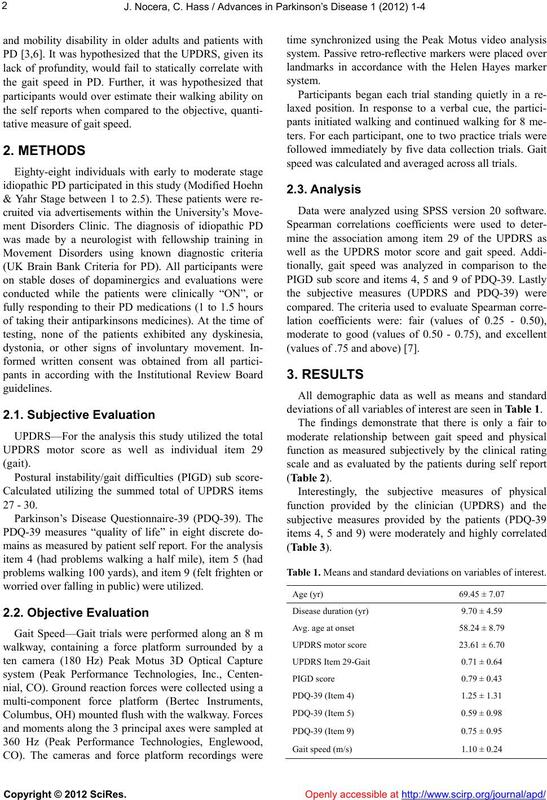 in the clinical study of Parkinson’s disease. evaluated by the patients during self report. examination item specifically focused on gait (Item 29). essence of PIGD given its 0 - 4 scale. those at increased risk of mobility disability and/or falls. tative measure of gait speed. worried over falling in public) were utilized. speed was calculated and averaged across all trials. Data were analyzed using SPSS version 20 software. (values of .75 and above) . deviations of all variab les of interest are seen in Table 1. Table 1. Means and standard deviations on variables of interest. UPDRS and gait performance as measured by gait speed. liable and validated objective measure of gait function. themselves in situations of high risk for a fall event. improve physical function (e.g. exe rcis e). increase the chances of a fall (e.g. medication use). were immobile as a result of overt mobility disability. Table 3. Spearmen’s correlations with p values between subjective measures. 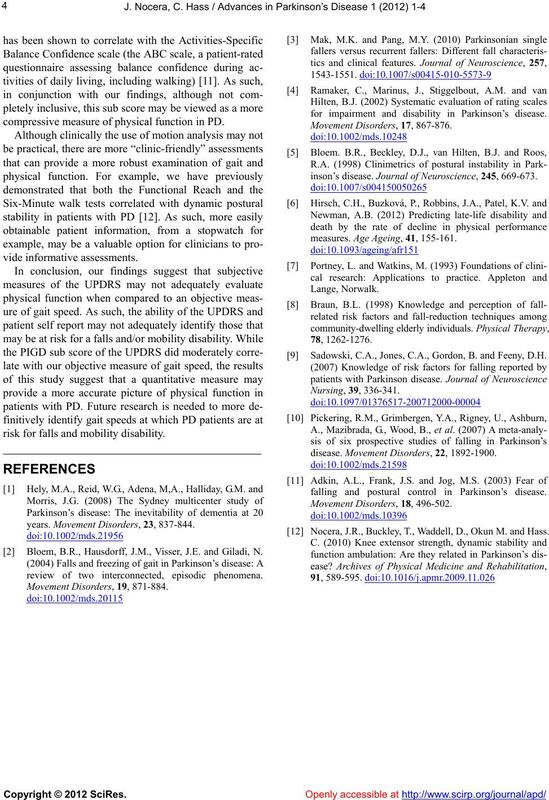 compressive measure of physical function in PD. risk for falls and mobility disability. years. Movement Disorders, 23, 837-844. Bloem, B.R., Hausdorff, J.M., Visser, J.E. and Giladi, N.
review of two interconnected, episodic phenomena. 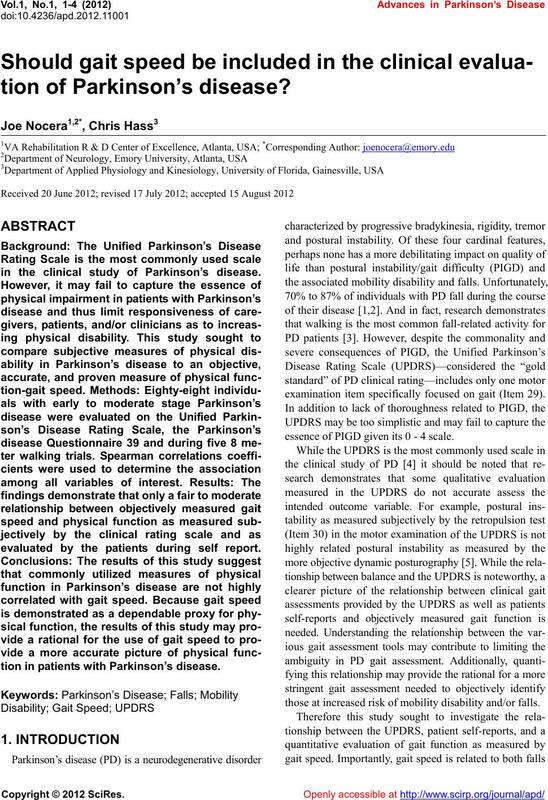 for impairment and disability in Parkinson’s disease. inson’s disease. Journal of Neuroscience, 245, 669-673.
measures. Ag e Ageing, 41, 155-161. Sadowski, C.A., Jones, C.A., Gordon, B. and Feeny, D.H.
disease. Movement Disorders, 22, 1892-1900.
falling and postural control in Parkinson’s disease. Nocera, J.R., Buckley, T., Waddell, D., Okun M. and Hass.